Annual membership is £55 + £1 per meeting attended. You can download a membership form here. We meet on Tuesday evenings at 8pm, roughly during term time, to socialise and improve our skills. Click on Programme above for more information. We also have photography walks and social events from time to time. 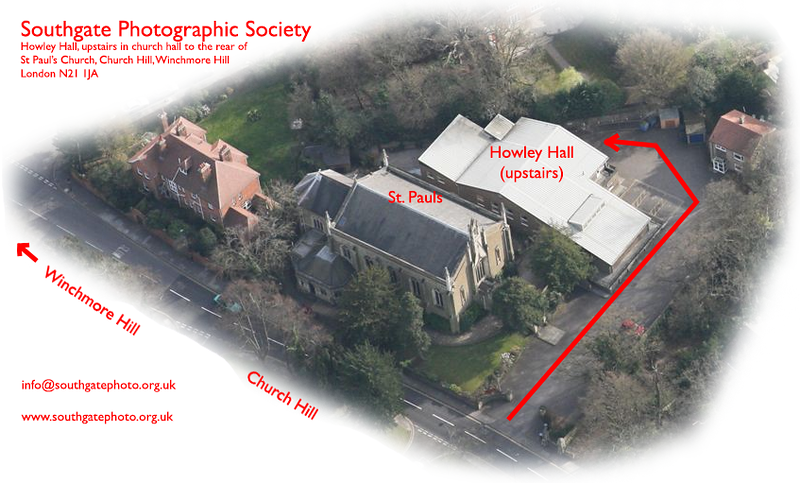 Find us in the church hall behind St Paul's church (map) in Winchmore Hill, N21 1JA. Meetings start at 8pm. You can park in the church car park. Walk to the rear of the building and enter via the door in the corner, to the right as you face the church. We are upstairs in the Howley Hall - see the picture below. For a map and directions, try here,here or here. Get in touch via info@southgatephoto.org.uk. Our club was founded in 1939 "to promote knowledge of the Art and Science of Photography" and to "encourage the fellowship and recreation of its members". We are affiliated to the Photographers Alliance of Great Britain (PAGB) via our local division, the East Anglian Federation (EAF). During the years the Society has seen the transition from home darkrooms to trade printing, monochrome to colour, film to digital, slides to JPGs and from printed programme cards to this website. The only thing that hasn't changed is the tea break at 9pm.